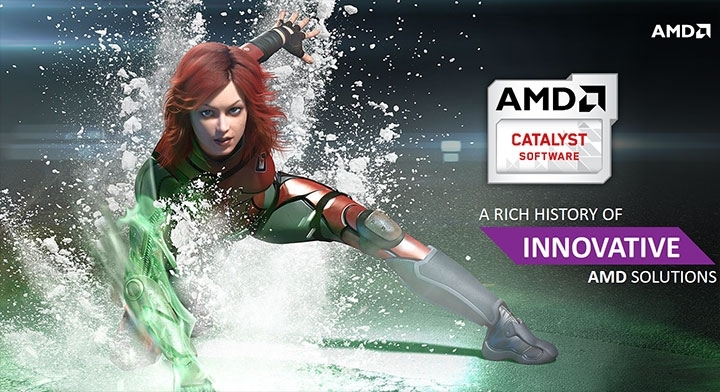 AMD has officially unleashed their latest Catalyst Omega drivers which are considered as a “special edition” driver, aimed to enhance performance across AMD GPUs and APUs while adding several new features along with bug fixes. 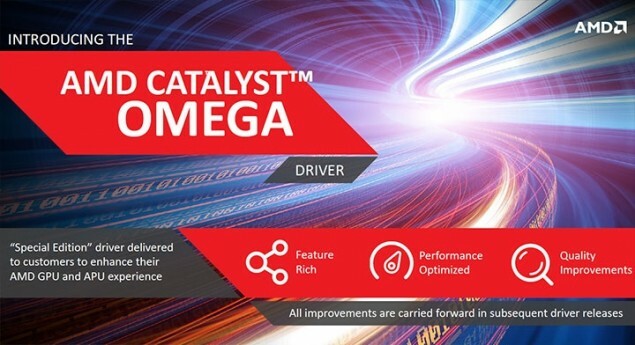 The AMD Catalyst Omega drivers. 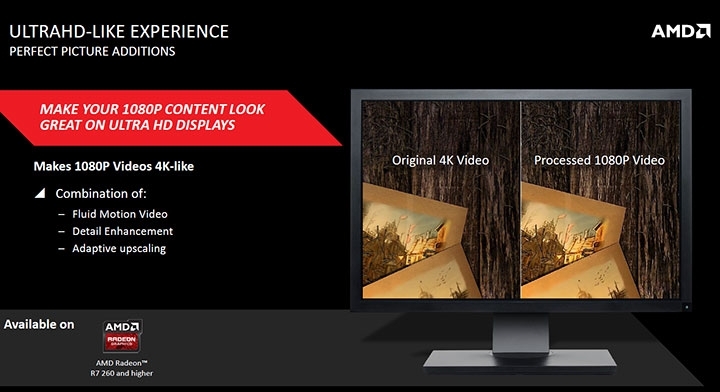 Some of the new features include the new 4K Virtual Super Resolution technology and Detail Enhancement 2 which will provide better in-game image quality. 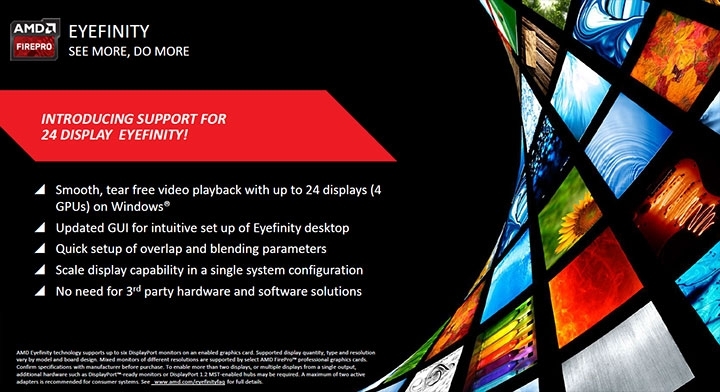 While the drivers adds 20 new features which we will detail in this article, it also fixes several bugs and helps improve performance in several titles, enhancing Crossfire support and delivering Freesync support in current and upcoming gaming titles. 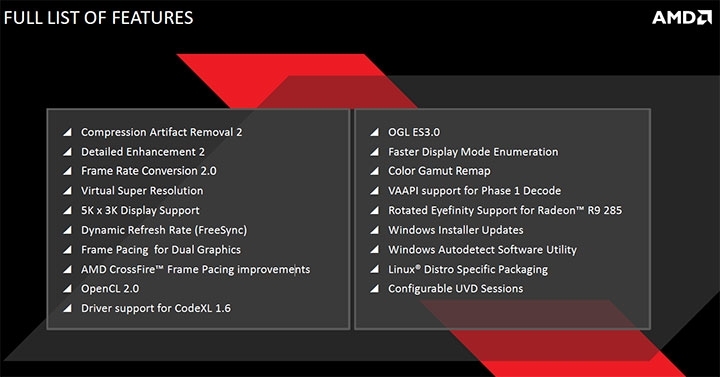 All the improvements from previously released drivers are carried over to the new ones while adding new features. 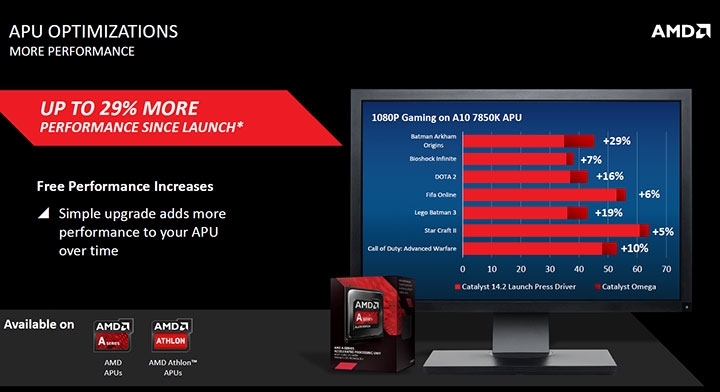 On the performance side, we are looking at a improvement across a wide range of products such as the AMD Kaveri APUs and Radeon R7 / R9 series GPUs. 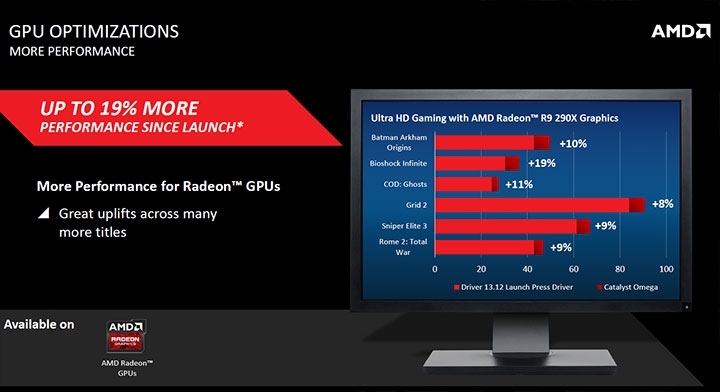 Some performance numbers show that the Radeon R9 290X is now rated at a 19% more performance since its launch press drivers and the same can be expected across the rest of the Radeon lineup family consisting of Radeon R9 280 (X), 285, 270 (X), R7 265, 260 (X), 250 (X). 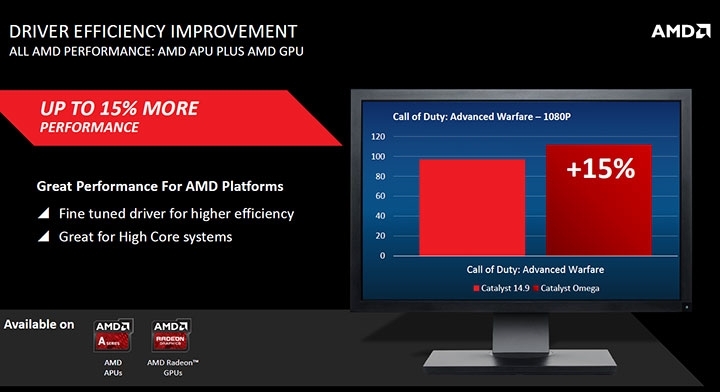 Same can be expected with Kaveri APUs with Dual graphics technology pushing a 15% performance increase in Call of Duty: Advanced Warfare at 1080P while the A10-7850K alone is rated at a 29% performance increase in several gaming titles since its launch. So we can already see that AMD is shining when it comes to performance increases across their product line through driver updates but the feature set introduced with Catalyst Omega is a lot more juicy. One of the new features introduced by AMD is Virtual Super Resolution, you might have heard that name before? No? I’ll give you a hint, DSR. 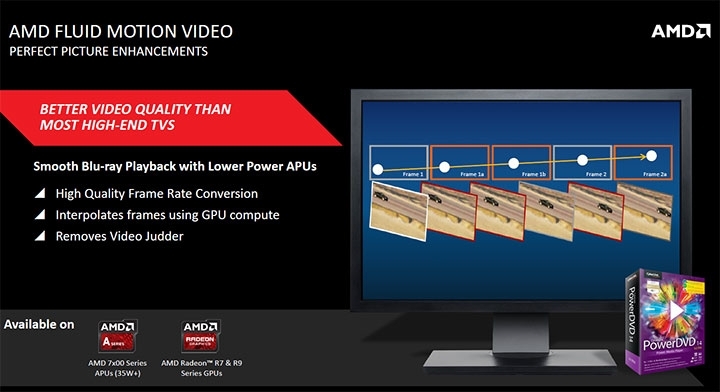 Yes, AMD’s VSR is similar to NVIDIA’s DSR which is a new downsampling technology that allows games to run at 4K quality detail on a 1080P screen monitor. 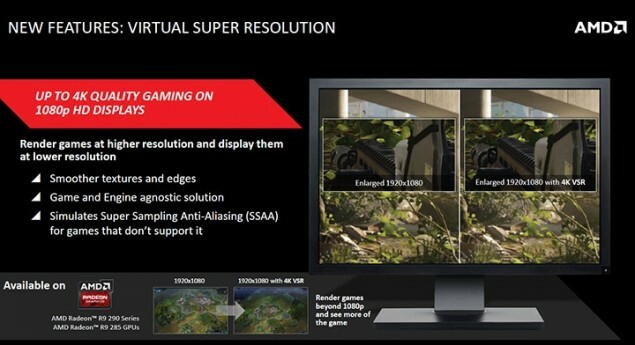 The end result of this is smoother textures and edges, better image quality and helps simulate Super Sampling Anti-Aliasing (SSAA) for console ports that don’t support the technology. 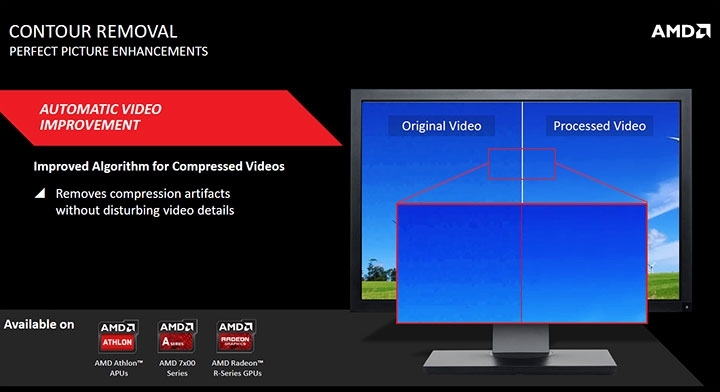 This helps in titles where the games are hard locked to 1080P resolution and have little to no AA options in the configuration settings. 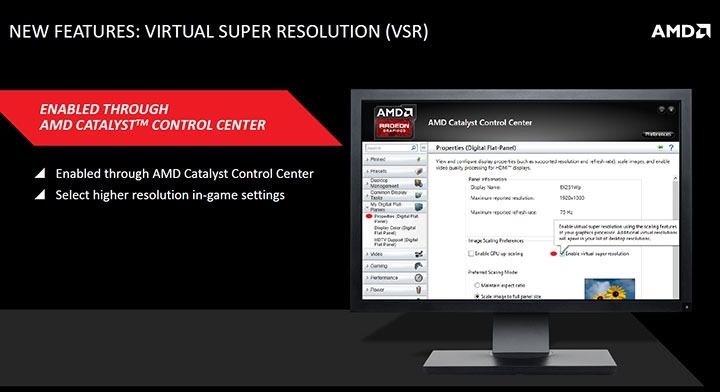 Just like NVIDIA’s DSR, VSR can be enabled for any title through the AMD Catalyst Control Center. 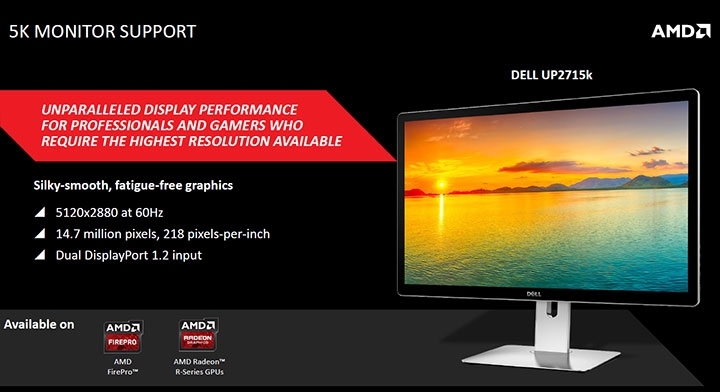 The monitors begin shipping in 1H of 2015 so we will see where it goes on from there. 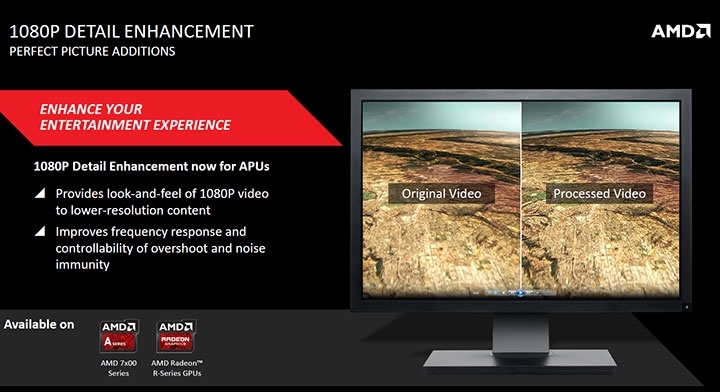 As for other tech, AMD also added the new 1080P detail enhancement 2 mode which essentially helps increase details of a lower res video to make it feel like a 1080P video. 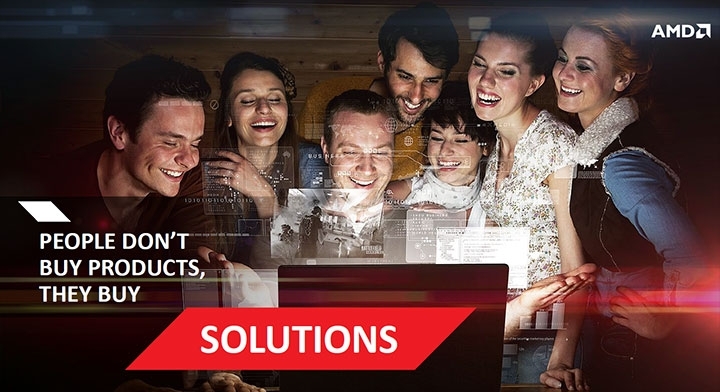 It takes a original video sample and processes it in 1080P that improves frequency response. 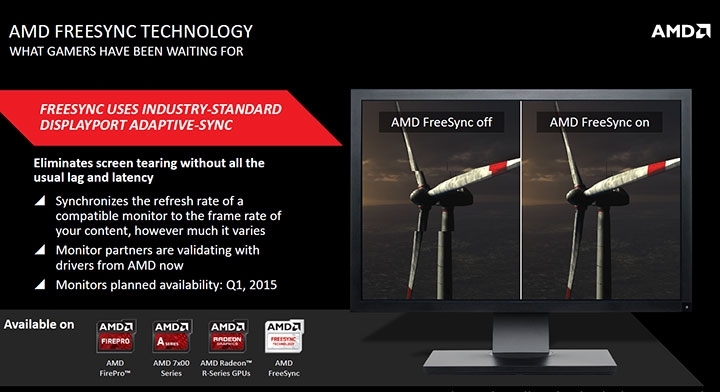 The drivers will be available to download shortly and we will link them here as soon as they are up on AMD’s official site here http://support.amd.com/en-us/download.